Anderson Jones, PLLC is proud to announce that Terra Johnson has joined the firm as a law clerk. She assists Anderson Jones attorneys by researching legal issues, drafting motions and briefs, as well as assisting with discovery responses. She is a native North Carolinian who graduated from Wake Forest University with a degree in Bachelor of Arts, Women’s, Gender, and Sexuality Studies. She began law school at Campbell University, and plans to graduate May 2019. She is an advocate on both the Mock Trial Team and the Moot Court Team, and she is a member of the Domestic Violence Advocacy Project. 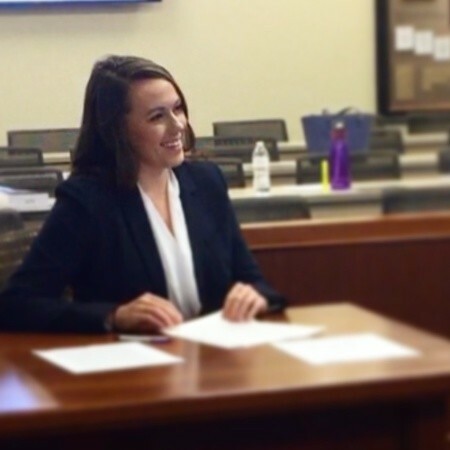 Her trial team last semester finished in the top ten at the National Trial Competition hosted here in Raleigh, at which she received an Outstanding Advocate Award. Additionally, Terra’s trial team recently completed the Mockingbird Challenge in Montgomery, Alabama, where her team finished in the top five (out of twenty-four teams). At this competition, she received one of five individual advocate awards, allowing her team to bring home a total of two trophies. After graduation, Terra plans to focus on Civil/Commercial Litigation Defense, in areas such as Construction Law, Insurance Defense, and Professional Negligence Defense. Welcome, Terra! We’re happy to have you on our team.